Like most sports, golf is a fun activity that people like to indulge in. It may involve fewer activities, but the injuries are inevitable. Majority of people think that golf is a soft sport, but it has both negative and positive impacts on your body. Many golf injuries are a result of long hours swinging the ball while standing in a particular position. It causes several injuries such as lower back pain, wrist or elbow pain to mention a few. Even though the orthopedic clinic in Jacksonville, FL, offers the best treatment, you should learn the various ways of preventing golf injuries. Outlined are five tips to consider while playing golf to avoid injuries. Before any sport begins, a 10 to 20 minutes warm-up session is mandatory. It helps prepare the body for vigorous activity. You can either take a brisk walk or jump at a fast pace for several minutes. Stretch your body a bit, especially the elbows, hands, and the wrist. Practice swinging the club for a few minutes as well. However, increase the pace to prepare your body for the sport. During a warm-up session, begin slowly and increase the warm-up pace gradually. If you start swinging the club hard, you will strain your arm and your body as well. If this happens, you should seek medical help from orthopedic care in Jacksonville, FL. Just like the other sports, golf requires strong muscles. You may think swinging the club is an easy task. Well, it’s not. With strong muscles, you’ll be less prone to an injury. Ensure to take strength training exercises to improve your muscles. You’ll be able to swing the club without experiencing any pain on your arm afterward. In order to sustain the same standards, ensure to enroll in a gym for more practice. On the other hand, joining aerobic classes will help you build up body endurance. You can also jog or try cycling if aerobics isn’t an ideal exercise for you. Some people like walking while others enjoy swimming. All these exercises will help prevent injuries such as lower back pain to mention the least. 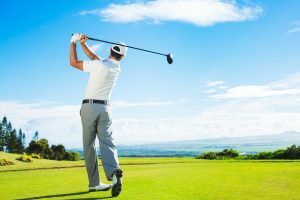 In case you suffer from a golf injury, the orthopedic center in Jacksonville, FL, will advise you to consider such activities to keep you in shape. Although orthopedic specialists in Jacksonville, FL, treat knee or ankle injuries, you should avoid wearing the wrong type of sportswear, which is the major cause of such injuries. Each sport has its own unique sportswear. For instance, golf sport requires comfortable footwear with short cleats. It’ll hold your foot down on the ground as you swing. Wearing long cleat footwear will result in an ankle or knee injury as your feet will be implanted heavily into the ground. To avoid injuring yourself, purchase the right golf footwear. We all know swinging the club in a golf sport entails unique body mechanism. If you don’t know how to swing the club properly, it’ll result in muscle and body strain. Eventually, you’ll suffer several injuries such as back lower pain, spinal cord pain or a hand injury among others. Therefore, learn to use proper body posture by avoiding bending over the golf ball. In addition, swing the club smoothly to avoid hitting the ground. The clubs bag is usually heavy. Therefore, it requires the golfers to lift and carry the bags carefully to avoid injuring their shoulders or back. Use your strong muscles to lift the bag from your car to the field. With these few points, you’ll be able to stay safe and enjoy the sport at the same time. In case of any injury, visit Southeast Orthopedic Specialists today for fast relief. Our physicians will be here to ensure you return to shape in no time.